Welcome to the 2017 Blogging from A to Z April Challenge. 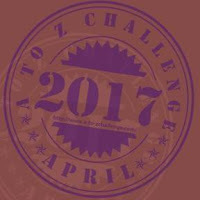 Be sure to grab the badge and display it in your sidebar so we know you are participating and link to the A to Z Challenge Blog. Blogs must be on an open platform – no Tumblr, Facebook, Pinterest, etc. – and comments enabled. Please make it easy for visitors to comment on your blog. We recommend short posts [approx. 300 words], turn off Word Verification, and visit/comment on five blogs (or more) a day. We recommend using the hashtag #AtoZChallenge in your blog post titles. That will help other participants find you on social media. Category codes are no longer relevant, however if your blog has Adult Content, you MUST mark your posts (AC)in your comments and/or on your blog for other participants. Leave a comment below with your name, blog title, link, theme or category, and a quick description of your post. Are you READY to Dance? BLOGPOST URL : Just a little RESPECT...please! Viva la revolución! Surviving the revolution in La Yacata! My THEME for the A to Z challenge 2017 is an ongoing speculative fiction story featuring telepathy. Each letter post is titled and inspired by a commonly misused word or phrase. Hello blogger buddies, Anami is here. It's another day in Amble Bay. Let's Ramble along the coastal path. Continuing to look at my family history by looking at an A to Z of different places they were associated with.I am not sure if there is any other image of this place. I found a photograph of a drawing amongst photos of family portraits sent to my grandfather in the 1960s. Each day I’m doing a post of random topics based on homeschooling files I’m going through and decluttering. R is for River Dog at Illegal Aliens as it discusses Roswell the TV show. After yesterday's quiet, today we're Running Around! Snippets from the life of Martha Sarah Ellis. Blogging about chronic health issues, patient self-advocacy and empowerment. Life with Reuben would never have been boring. Find out why in "Fact or Fiction-Family Stories". Rahab, a prostitute, is an unlikely ancestor to Jesus Christ, but her story gives hope to all who have chosen a fallen path. Link: #AtoZChallenge R for Ralph a family history pet story. Today R is for Really Busy. R is for Regrets. I am using Amy Krouse Rosenthal's "Encyclopedia of Me" to journal daily. She ran when she wasn't supposed to and made history. Theme: Books, Books and More Books! What could you possibly hate about writing? Come find out! Strange things happening on the Radio in today's short story on the Wolf of Words. Again! I forgot to post here again the last couple days. Grrrrr. Anyway, looks like my wife is about to kill me again. Literally. We have to stop meeting like this. It'll only cost you about 1 minute. My "theme" - A Thirty-Word Story, revealing one word of the story each day of the challenge. The Theme at Operation Awesome is the Publishing Journey. Roses have been part of our lives for ages symbolizing various emotions. 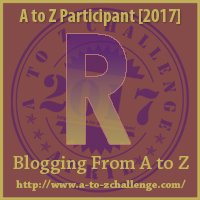 In the #AtoZChallenge our entry for R is our Ode To Roses!!! Here's my post for today. The city mayor is flummoxed by an unusual turn of events. R is for Radio Waves, which fill the universe and tell us all sorts of nifty things. If you tune in to AM 1420, you can hear the hydrogen in outer space talking to you. Doling out a little blogger recognition today for the a to the z.
R is for Relax and Rehab my Recipes! A to Z Theme: Exploring The Beauty Of Living. - An article about the perfect relationship. AtoZ theme: Materials Science underpinning fiction. My name is Narinder and my blog is titled "Create Your Best"
"Female Scientists Before Our Time"
R is for Ring The next part in the ongoing crime drama. Today on my A-Z of Favourite Things, R is for my new favourite music artist - Rag'n'Bone Man. It's a blast from our past with Runty Cat. Rally over to see Art Sketching Through the Alphabet "R"(Realistic Rabbit & a Rascally Roadrunner) with Curious as a Cathy! Happy A2Zing!! Letter R: Relics. Would you visit this place? R is for Requisite in my LEGO themed post of the day! Mail art from A to Z. Today I'm looking at my favourite movies, TV series and books featuring awesome animals. Perhaps you have a favourite to share? I show RESPECT by communicating. Theme - Whispering Chimneys: My Altamont childhood...where my genealogy journey began. After two years of construction, it's beautiful! R for Routine in my mental health themed challenge on Milly's Guide. Friday is Flash Fiction day, and the story today features a favourite character of mine, Sir Woebegone. have a lovely day, everyone. We all have an inherent survival instinct within us. And I'm not just talking about us humans, but about ALL living things. The whole planet, in fact. We are NOT made to give up. This resilience is what allows us to come out of difficulties and adverse life conditions. In today's post, I discuss 10 Characteristics of Resilient People, That Make Them Happier. Please read and share your feedback. I finally reveal my Hogwarts House in today's post for R! If you like quick, fun puzzles, and especially if you have an interest in science fiction/fantasy topics, stop over at WordWacker for some A to Z haiku! Here is a link to my post for R from my blog Weekends in Maine. Thanks for visiting! R is for Recyled Lobster Rope Mats|No better way to say 'welcome to my home'. Katherine at Rodney's Saga: Horses, Life, A Touch of Geek. Got Rick Ross on the music radar today, enjoy! MK French has a list of Romantic Tales at Girl Who Reads. Blog: Read All The Things! Post: R is for “Read All The Things!” What has blogging taught you? R is for the Ring of Gyges! Daily 3- line poem (5-7-5, haiku form); first letter of each line same as the letter of the day. Today on Sciency Words: A to Z, a scientific term that means the opposite of what it should mean. Theme: The crew stumbled across a ball pit at MacSweeny's. Like everything else, it gets a bit crazy. Vacations are time to relax. How do you relax? Sorry, I messed up on my link above. We are running out of letters!!! Letter: R is for Repeat! Talking It Out's topic today (with a guest poster) is Religious Fundamentalism. Blogging about novels for young adults. R is for Resilient. One of the occupational hazards of substitute teaching--having to watch the first 55 minutes of a video over and over without getting a chance to see the end. Ugh. Which is how Repeated starts. But it ends a bit differently this time. From Laws of Gravity. Today it's about a quality I just don't have. Also the pic today is so cute I can't stand it. I am also dabbling in some dark poetry (short) creativeness on: Link "
Please leave your opinions and feel free to ask anything that is on your mind. Irrelevant anonymous comments and spam will be deleted.